Throughout the years you've probably accumulated a number of hard drives. Rather than leaving them to lay about gathering dust - or risk your data security by throwing them away - you can quickly and easily turn them into external hard drives with this top-loading dock, the StarTech.com USB 3.0 to SATA IDE HDD Docking Station. Inserting the drives into the bays much like you would bread into a toaster is quick and trouble-free, and the dock makes use of the high speeds of USB 3.0 to make these drives a viable back-up solution. 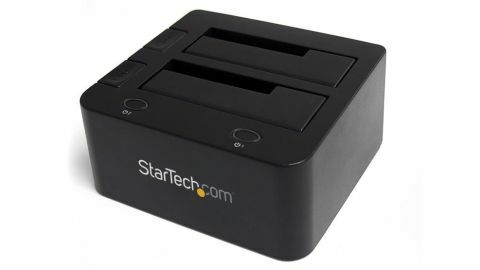 What makes the StarTech.com USB 3.0 to SATA IDE HDD Docking Station stand out from other docking stations is that while one dock uses the SATA hard drive interface - which all new hard drives use - the other dock uses the older IDE interface. This gives the StarTech.com UNIDOCK3UGB a versatility lacking in SATA-only docks, since you're probably more likely to have an old IDE hard drive knocking about - but in the future you'll likely have a spare SATA hard drive as well. Adding and removing hard drives - especially SATA drives - is very easy, and they show up straight away on your PC. If you have a combination of SATA and IDE drives lying about, then this is a great way to turn them into external hard drives. Another great use for this is copying data from an old IDE drive into a new SATA drive quickly and easily.